Customer relationships aren’t just about people anymore. We are moving away from an environment where personal relationships had a lot of power, to one where ideas and innovation are the primary currency that drives customer relationships. When I speak to senior people who are in charge of important customer relationships, there are two things they always tell me. The first is that they’re doing a good job. The second is that they have a “good relationship” with the customer. Last week, I wrote about the risk of being a one-hit wonder; a supplier that isn’t invited back for a second contract term. Sure, you might think, that could happen – but never to me. So let’s dig a little bit deeper. How can we define a “good” customer relationship? What does it really look like? How do you know if you have one, or not? 1. You set regular performance review meetings with the customer, but they keep pushing them out or cancelling. 2. 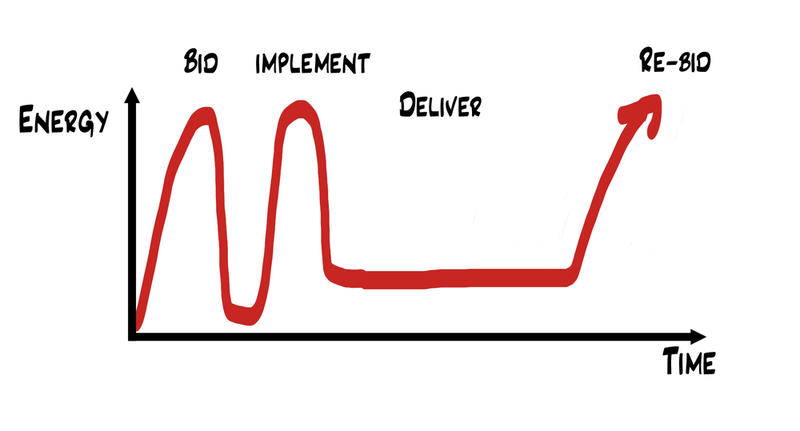 Your service delivery plan looks exactly the same as the day the contract started. 3. You're hitting all your targets or key performance indicators (KPIs) easily. 4. You hear that competitors are in there pitching new ideas. 5. There are changes coming up in the customer's business that you don’t know about, haven't thought about, or haven't developed a strategy to help them with. These risks are easily avoided if you have a plan. You can call this anything you like; a retention plan, a growth plan, or a client service plan. I call it a “Ready to Re-compete” Plan. What's important is that you actually HAVE a plan for change, and that you're not just delivering on the baseline of what the contract and the customer originally asked you to do.